Statix Festival burst onto the scene in 2011, bringing something rarely seen in Malta’s electronic circuit: multiple stages featuring different genres right next to each other, with a line up made up exclusively of Maltese artists. Seeing the stages in full gear before your very eyes was a beautiful thing. Statix Festival returned last year to once again focus on some of Malta’s most up and coming DJs and producers, and 2016’s line up is just as incredible. Over forty local artists over three stages in two days: Friday will be featuring House, Techno (producers) and Electronica/Psy. 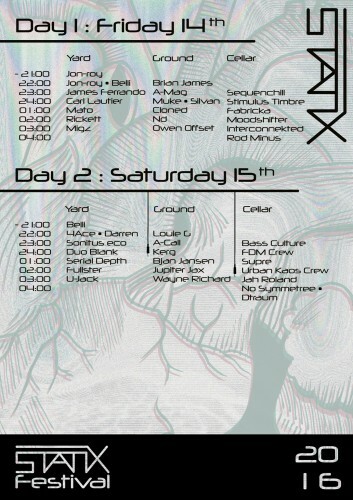 Day Two will be split in Techno, Electro and Bass (Dub/Dubstep/D&B). In preparation of this fine selection of Malta’s electronic talent, here’s a few words from some of the artists themselves who will be playing over the weekend. I’m planning a grimey set with a couple of dubplates – one track I’ll definitely be playing is Hard by Newham Generals. I’m planning on starting with some really old school grime, then moving all the way to new school. I don’t really intend on keeping the tunes together, and more just focusing on creating a journey with the drops. I’m also working on my album TIME, and I’ll be playing a couple of tunes of that. I have an early set, and I’ve always been given a platform to experiment various genres with Statix, so needless to say The Stomp fever kicks in with a groovy breaks/acid/house set. I’m very drums orientated with my tracks so I’m sure a good 90% of my tracks will be very raw. We have recently produced a lot of new material but as usual one day we are doing a deep house track, another day I am messing on my modular and doing a bit of ambient and another day I rack up my rig and do an eighties influenced one..like this track – but don’t be fooled with the Eighties feel as most our set will be techno. I’ll be playing B2B with Darren (Faddy) which is a first for us both. Faddy will be playing on vinyl while I’ll be following his lead on CDJs and vinyl. Music selection will be spur of the moment. I expect a few oldies along with some current bangers. I’ll be bringing the heat with some rapid fire hi-hats, low sub-bass, and some rare tunes. I’ll be switching tempos and dropping some choice trap beats, both new and old, while seeing how many tracks I can mix in and how much bass I can drop in one hour. Being quite an early set into the night I will be doing a deep techno set with a slower paced tempo and also some dub techno. I will be playing some of my tracks, even maybe a couple of unreleased ones along side some new releases from various artists. I might even throw in a couple of “classics”. I’m going to play UK garage, also known as UKG. It’s a genre of electronic music originating from the United Kingdom in the early 1990s. UK garage was largely subsumed into other styles of music and production in the mid-2000s, including 2-step, dubstep, bassline and grime. Well I’m playing on the Friday in the house room at 2 AM so will definitely be going for more bass-driven and jackin’ stuff. Don’t know what tracks I’ll be playing for sure yet but there will lots of acid house, that’s for sure. I am planning to play 130 / 132 dark banging techno with some groves in it. Obviously this will depend on the crowd and I will adjust accordingly. My intention is to close the night banging so we prepare them for Saturday. Some of the tracks that I intend to include are my track Platen which was vinyl released some months ago, Inhale which will be released in November with Joey Beltram and Joe Wittikind as remixers and I also intend to include one of my favorite tracks Slam – Make You Move. So it’s gonna be one hour of intense techno. It’s all about the drum n’ bass. The genre roots itself in the UK rave scene, and has spread around the world, notably to Europe, Russia, and the USA. Catch me at Statix Festival alongside Malta’s finest local artists and DJs. I will bring you the full spectrum of dark and heavy Drums and Bass. Statix will be taking place on Friday 14th and Saturday 15th October at Razzet L-Ahmar, Mosta. Tickets are available online here.